(Rockaway, Oregon) - It's a chilly winter's day on the north Oregon coast, sunny and bright but paradoxically stormy as well. This is a glorious state of the confounding and confusing, as the blue skies and sweet rays make for quite the puzzling display with those diametrically opposed conditions of wild surf. 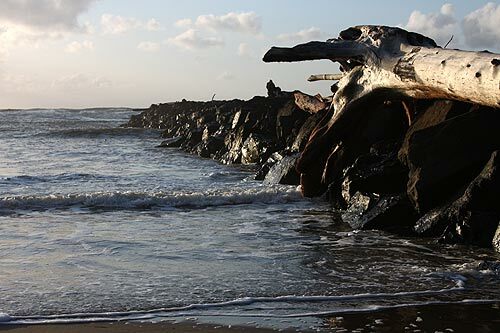 Here, at the southern side of the Nehalem Bay mouth, at Rockaway Beach, the south jetty juts out into the sea and dares it to attack. So, the ocean does just that – as evidenced by the massive objects strewn on top of it. Entire trees sit up there, standing as testament to how gnarly these tides are – and it serves as a bit of a warning to why you shouldn't go up there. You can see further evidence of the power of these waves all around you. 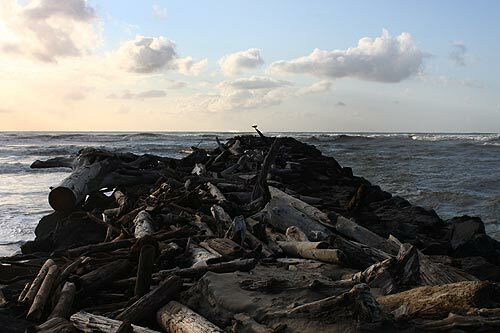 The entire beach here, quite a ways back from where the tide line usually loiters, is littered with humongous chunks of driftwood – all deposited here by unruly tides in the past: tides that tried hard to lash out towards the homes and community a few hundred feet back. On this day in late January 2012, the sea is trying to be angry. It's not as angry as it had been the previous days, but it's looking pretty antsy. The bay mouth is swollen here, and an awe-inspiring rush of water constantly shoots outwards the sea, especially after a series of incoming waves pushes ocean water into the bay. It comes screaming back, a little ticked off. You don't need to be a rocket scientist to realize that current is insanely dangerous. To accidentally slip into that would mean certain death – if not by almost immediate drowning, then surely by getting smashed against a boulder at a brain-splattering speed. The inside of the bay is a bit more lively than usual. Often, the outer edges of the jetties are the unruly parts of the sea, and the area inside is tamed by the presence of these structures. Today, the tide inside is just as frightening as the rest of the sea, but in a different way. 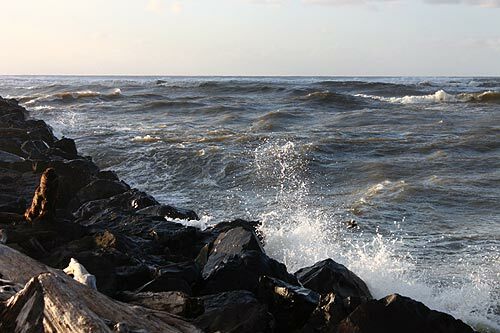 Periodically, a series of waves creates somewhat hefty splashes alongside the south jetty, not far from you. It too is a reminder of the power here, and to not get too complacent lingering around on top. You are, in actuality, not supposed to go bouncing around on top of the jetty. It's not made for that, but one spot quite a ways back has a somewhat flat, sandy area that lets you loiter. It's not too dangerous, if you don't linger for long. But how old is the south jetty? When was it constructed? 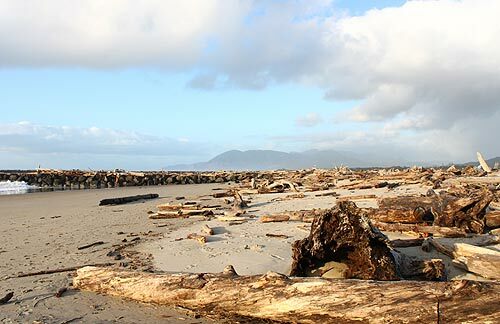 The jetties at Nehalem Bay are almost 100 years old. This southern end was built in 1916 by the Army Corps of Engineers. The north jetty followed in 1918. The southern side is 4,950 feet long, according to the Army Corps of Engineers, and the north jetty is 3,890 feet. Both were part of a restoration project in 1981 and '82, with more than 347,000 tons of rock put into the tips of the jetties. Over the first few decades, the chunks of it were taken away periodically by underwater currents and big waves.